There is a particular scene from the Chevy Chase movie Funny Farm that will always get a laugh out of me: Chevy and his wife are trying to adjust to their new lives in a rustic Vermont town and end up eating dinner at a small cafe. Chevy has plowed his way through two orders of lamb fries and starts working on his third plate in an effort to break the cafe’s record of 28 fries eaten in one sitting. He easily tops the record and keeps going for more … until the waitress tips him off that he has in fact been eating lamb testicles. Ignorance can sure be bliss (it certainly was in Chevy’s case), but let it be known that testicles are celebrated by people around the world for their culinary as much as their reproductive properties, and you can enjoy them as well. The general consensus on “fries,” as they’re often euphemistically referred to, is that they have a chickeny flavor to them (no matter the animal of their origin) and can be a bit chewy, much like gizzards. A very basic preparation involves blanching them in boiling water for a few minutes, then shocking them in ice water to stop the cooking process. Cutting off the outer membrane is best done right after rescuing the testicles from their cold bath. Once that’s done they can be sautéed, deep fried, grilled, roasted, poached or braised with tasty results. That’s not to say that Americans are neglecting their testicles either. Various fairs across the United States serve breaded and fried testicles, more commonly known as Rocky Mountain Oysters. There is even some mild rivalry between Eagle, Idaho’s volunteer fire department and Clinton, Montana’s Rock Creek Lodge as to who hosts the largest Testicle Festival in the states. 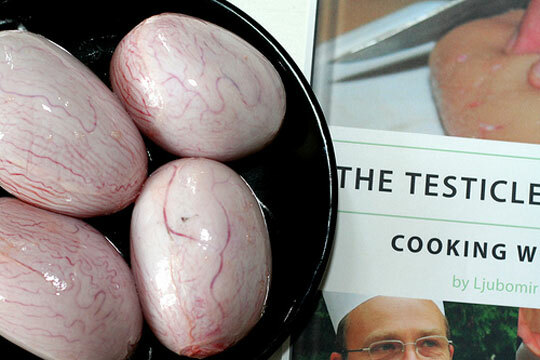 Finding a good source for testicles is tricky. While you may be able to find a few different types available at your friendly neighborhood Asian Supermarket, it’s not a sure thing. Veal testicles should be available from local cattle farms from time to time, though you are much more likely to find them frozen than fresh. If its lamb fries you’re after, I hope you’ve managed to befriend a butcher to the point he’s added you to his Christmas card list — pretty much all male lambs are castrated shortly after birth these days, which tends to cut down on the availability of fresh fries. Your best bet is heading to a Halal market and checking their meat department. Every time I’ve visited one, I’ve found lamb fries along with various other goodies. When you do manage to find them, you’ve got to make sure they’re up to snuff: check and make sure that the testicles are firm and pinkish in color. Some will have their outer membrane still on, though some butchers go the extra step and remove it for you. Like most other glands, they’re more delicious the fresher they are, so try to buy them within a day or two of your planned use — though if they’re already frozen, they can stay in that state for quite a while. *Be sure to ask your butcher for calf testicles, not bull testicles. Calf testicles are the size of a walnut and are much more tender than the larger bull testicles. With a very sharp knife, split the tough skin-like muscle that surrounds each testicle. Remove the skin (you can remove the skin easily if the testicles are frozen, then peel while thawing). Slice each testicle into approximately 1/4- to 1/2-inch-thick ovals. Place slices in a large pan or blow with enough beer to cover them; cover and let sit 2 hours. In a shallow bowl, combine eggs, flour, cornmeal, salt, and pepper. Remove testicles from beer; drain and dredge thoroughly in the flour mixture. In a large, deep pot, heat oil to 375 degrees F. Deep fry 3 minutes or until golden brown (will rise to the surface when done). Drain on paper towels.